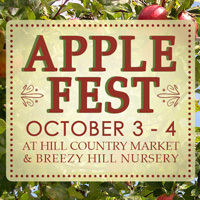 Hill Country Market and Breezy Hill Nursery are hosting an Apple Fest Saturday, Oct. 3 and Sunday, Oct. 4. Come enjoy apple and cider samples, a hard cider tasting, decorate your own caramel apple, an apple tree sale from Breezy Hill Nursery Garden Center & more. Free to attend. Hard cider tasting will be available Saturday, Oct. 3 from 11 a.m. to 2 p.m. Samples and caramel apple decorating available all weekend. Caramel apples are $2.99 and the decorating station is free. Come join Hill Country Market and Breezy Hill Nursery for Apple Fest and enjoy the flavors, sights and colors of the season!